Here is the note from the Editor’s Desk in the forthcoming edition of the Talking Economics Digest, releasing this week alongside an ‘Expert Voices’ panel discussion and networking evening. “If growth is what you want, jobs is how you get there” – thought-provoking words by Paul Romer, renown growth theorist and economics professor at NYU’s Stern School of Business at the IMF-World Bank Spring Meetings in April this year. Amidst the current global economic turmoil, the focus is not just on bank recapitalizations, government debt, and sovereign ratings anymore – it is also on the tremendous challenge of getting economies moving so that people get back to work. From Asia to Africa, from struggling Europe to recovering America, unemployment is omnipresent. The ILO estimated that of the 220 million people unemployed globally (2009/10), 81 million were youth. With a waning demographic dividend and challenged by youth unemployment and labour market constraints, this issue is important for Sri Lanka too. It remains a critical medium-term policy challenge. 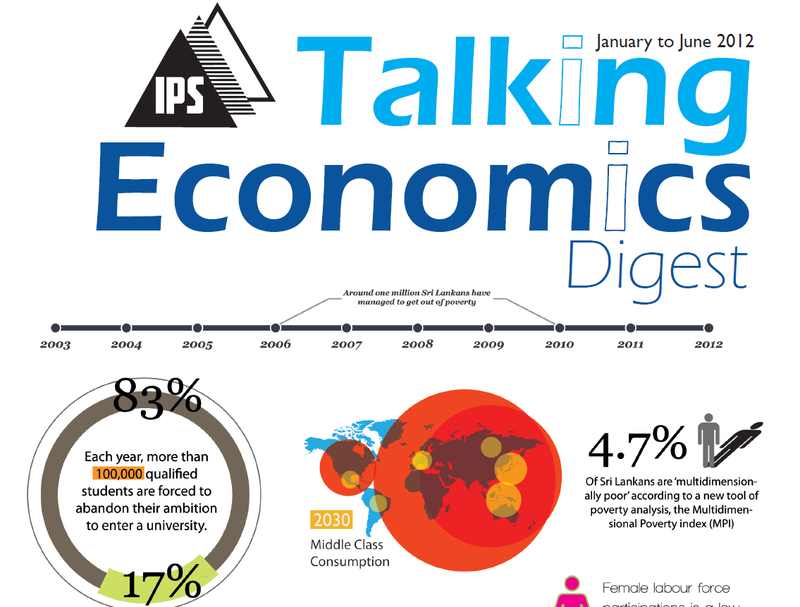 So, in this edition of Talking Economics Digest we have chosen the “jobs challenge” as a cross-cutting theme. This edition provides interesting perspectives on different elements of this challenge – expanding tertiary education, the debate on better jobs, female workers’ challenges, small business schemes like Divi Neguma, etc. Look out for the blue “Jobs Challenge” icon on pages that contain articles that are part of the special theme. This edition also contains articles on poverty, environment and climate change, global economic prospects, interviews with regional experts, and of course the popular “Fast Facts” page. Creating more good jobs in Sri Lanka must be driven by private enterprise growth across the country. Creating an enterprise-friendly environment with consistent policies and incentives is fundamental to this. One of our guest contributors in this edition, Kalpana Kochchar (Chief Economist, World Bank South Asia), notes that to tackle the jobs challenge Sri Lanka needs to focus not only on education but also on business climate issues that affect job creation. In this context, Sri Lanka continues to struggle with the issue of consistent ‘policy-signaling’. Beginning a year ago (June 2011), with the introduction and subsequent withdrawal of the proposed private sector pension bill, it has been a year of policy “U-turns”. A “plastic crate law” – a regulation mandating vegetables be transported in plastic crates to reduce post-harvest losses – was introduced, subsequently suspended due to heavy opposition, and introduced months later in a watered-down form. An “expropriations bill” was passed in Parliament hurriedly, creating much private sector anxiety. These are unfortunate distractions from the unique and undoubted economic opportunity Sri Lanka now faces. In a special interview in this edition, IPS Executive Director notes that one of the ‘top three messages for policymakers to ensure that Sri Lanka fully capitalize on the end of the war’ is to “avoid policy reversals and ad hoc policy making so that consistency and predictability in the policy regime is maintained”. 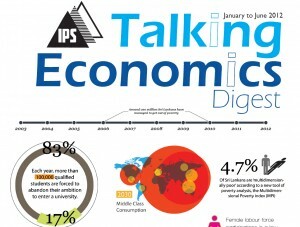 Articles in this Digest attempt to draw out the dilemmas of youth unemployment in Sri Lanka. But it appears we are not alone – from the UK to the UAE Sri Lanka’s predicament finds resonance. Jeffrey A. Joerres, head of global recruitment firm Manpower remarked in a recent interview that “many UK firms complain they cannot find good people to hire […] and youth coming out of college do not have the skills relevant to the workplace”. Despite this apparent skills shortage, the UK is facing 17-year high unemployment – 2.5 million people out of work, but 500,000 vacancies! Studies by the IFC (MENA region) show that one in four graduating youth in the Arab world can’t find a job, and 50-70% of them want government jobs. In a speech last year to the World Economic Forum on the Middle East titled ‘Addressing the Employment Challenge’, Queen Rania of Jordan remarked that, “too many young people believe that the best future lies in a safe secure government job. We must re-engineer their expectations”. So, yes, the Arab countries’ problems may sound similar to ours, but they are also finding innovation solutions which Sri Lanka must sit up and take notice of. Innovative initiatives like Oasis 500 in Jordan, Seed Start Up in Dubai and Plug and Play in Egypt are fostering a network of mentors, investors and incubators to help to fill finance and skills gaps for young people. ‘Business boot camps’ and ‘entrepreneurship clubs’ are springing up in university campuses across the Middle East, partnering with the private sector. The larger challenge for Sri Lanka remains with reforming education, particularly higher education. An important first step in this, the hotly-debated private higher education bill that would expand higher education options for thousands of youth, also fell victim to the policy U-turn climate this year. To bring down unemployment and raise up our youth, Sri Lanka needs to move fast on: essential education reforms; revisiting archaic labour market regulations; improving the quality of training; promoting private sector initiative; fostering a culture of entrepreneurship and work experience among youth; and ensuring a secure stream of innovative funding to support them. These are a sine qua non for inclusive growth in the country. Strengthened by a consistent policy environment, these reforms can help Sri Lanka unleash the pent up economic potential of its people and businesses.